One of the primary drivers behind a lot of the optimism on Wall Street for 2011 is the relative health of the balance sheets of U.S. corporations. Many corporations seem to have learned their lessons from the great credit crisis of 2008 and, in turn, taken the opportunity to de-leverage (i.e. reduce their own respective levels of debt). 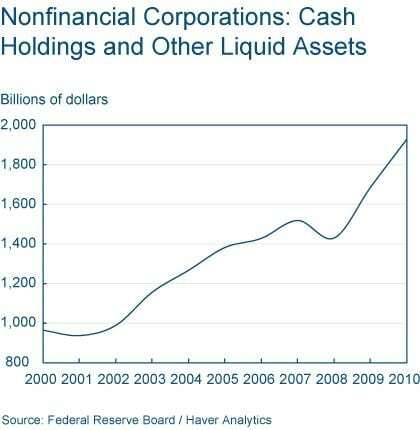 Given the growth in corporate earnings in 2010 and the overall lack of corporate spending, cash on corporate balance sheets has ballooned. To this end, according to a January 10, 2011 report entitled, A Cash Buildup and Business Investment, by Robert Sadowski of the Federal Reserve Bank of Cleveland, U.S. corporations continue to stockpile their cash holdings and other liquid assets. By the end of the third quarter 2010, these types of assets totaled $1.93 trillion, which represented an increase of 14.4% over the prior year and an increase of 4.7% for the quarter. 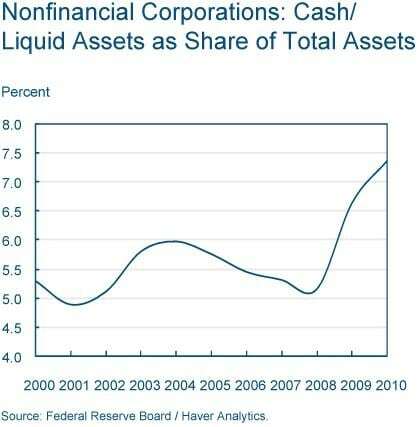 Further, this report also highlighted cash holdings and other liquid assets as a share of total corporate assets rising around by approximately 2% since the start of the most recent recession. This share; 7.4% as of September 2010, is the highest relative cash % for U.S. corporations since the mid-1950s. All of this idle cash lends itself to a great potential deployment of money by U.S. corporations in 2011. This deployment of cash could take the form of dividend increases, stock buy-backs, workforce additions (i.e. new jobs), operating expenditures and even mergers or acquisitions. We have seen one recent example of these available deployment options surrounding the speculation that banking giant J.P. Morgan’s will be raising their own dividend. Given the extension by Congress of the Bush-era tax cuts for the next two years, and underlying favorable tax treatment of dividends, these conditions could make value oriented, dividend investment strategies attractive during the course of 2011.